It’s a good writing day. My WIP and I are getting on like a house on fire. With last.fm in the background, I feel practically unstoppable. That said, I know the words won’t always come this easily. With much celebration and elation, I’ve reached the first 1000 words mark of Wheels. Denny and Scott already felt like good friends, but now we’ve become even closer. I’ve not quite reached the stage where Denny’s telling me what to do, but that will come, I am sure. If you’ve read any of my earlier posts, you will know that I find it difficult to celebrate anything to do with my writing. So, that’s where #1000wordrewards comes in. When I passed 1000 words on Wheels and stopped writing for the day, I decided that I would put some music on as loud as I could stand and sing along. Others might have loftier goals, or celebrate in different ways. I want to find out more about how we celebrate our successes. Writers are by nature solitary creatures, and there’s only so much self-congratulation that Twitter and Facebook can take. As writers, we need goals, but I’m more interested in the rituals we create to celebrate the achievement of those goals. Even if you’ve just got a bottle in the fridge for when you finish the novel, I want to know about it. 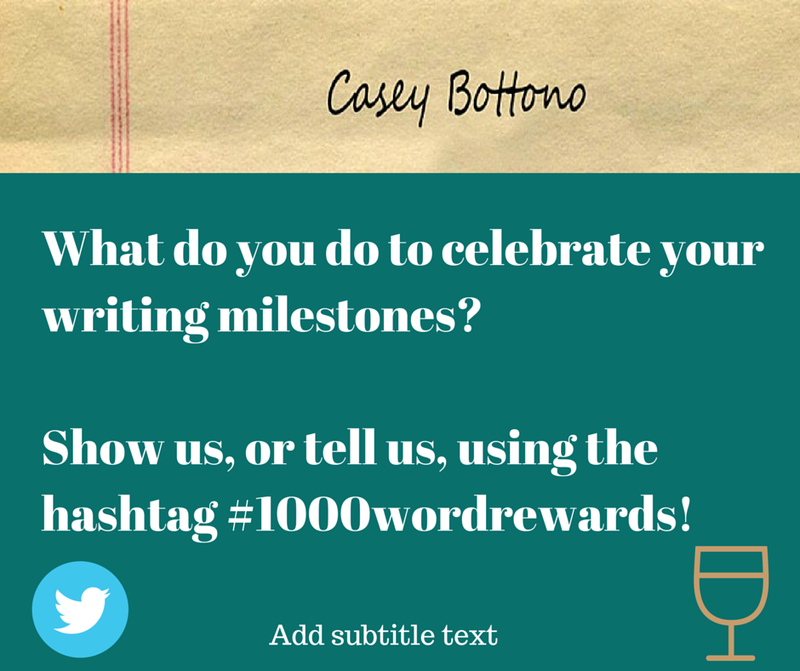 Leave a comment below to tell me about your #1000wordrewards, or tweet me. Maybe we’ll find some new ways of celebrating each other’s milestones. This entry was posted in Wheels, Writing and tagged achievements, craft, milestones, writing. ← Last Time You Fell In Love? 1000 words a day is tough. Congratulations! I like to celebrate with a short drive if I’ve reached a week’s worth of daily goals. My word, you’re diligent. I’m getting better at taking daily goals day by day. I feel blessed that this piece is unfolding just as I want it to. Long may our successes continue.